First off, I’d like to apologize to anyone who tried to leave comments while we were away (I hope there were a few :-)). I had switched to the new blogger in December and realized too late that the commenting system somehow got messed up and were not accepting or saving any comments. My super talented template designer, Chas, has fixed the problem, however, and now we are back in business. Thanks, Chas! We are back from vacation, and are now sorting through over a thousand photos. 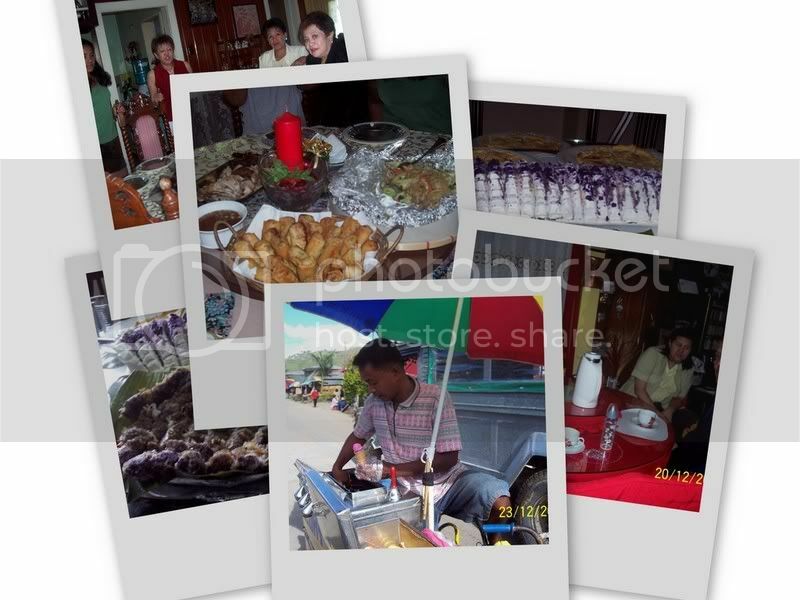 Here’s a few of the meals offered to us from the numerous homes of friends and relatives who graciously received us in their homes and presented us with the best meals that we didn’t even have time to try out any restaurants. A couple of days after our arrival, our first destination is Baguio City. This lunch, at Aunt Connie and Aunt Liza’s house was waiting for us. After doing a whirlwind tour of the city for the girls’ benefit, we were treated to merienda’s, dinners, and breakfast at different homes because everyone wanted us to come by and visit even if just for a few minutes. I wish we could have had more than a couple of days to spend in Baguio but we had a full itinerary for the two and a half weeks that we were there. 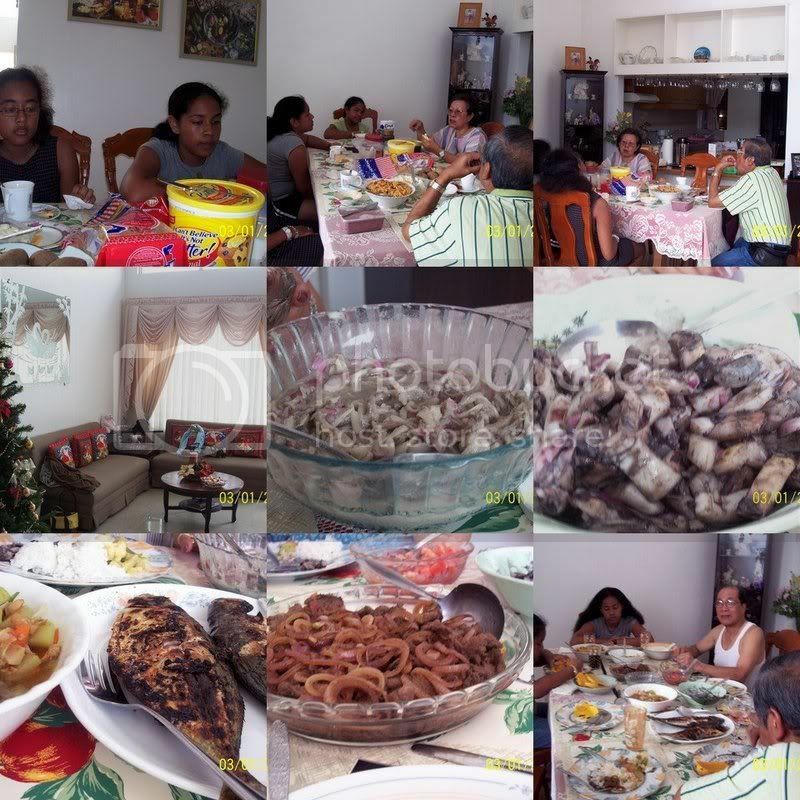 We also visited our relatives in Agoo and Aringay, La Union, and another feast was presented to us along with lots of stories and reminiscing. The girls also enjoyed their swim in Auntie Josie’s pool. Unfortunately, we didn’t have time to picnic by the beach as we had done numerous times as kids. I had been dreaming of this for a long time. Thanks to my La Union relatives, my craving has been sated…for a while. Our gracious host in Santa Ana, Auntie Chita, made sure we were well fed with every meal. In the photo among many are Monamon Kilawin and Squid salad with ink. Yumm! Here’s one more table, from Auntie Febe’s House in Cainta. So with all these meals, and this is just a sampling of them, is it any wonder that I came back home with tight fitting clothes? 😀 I’m not complaining, mind you. I enjoyed every calorie ingested. Thanks to all our hosts! Oh, and you’d think our eating days were over when we left the Philippines? Not so! 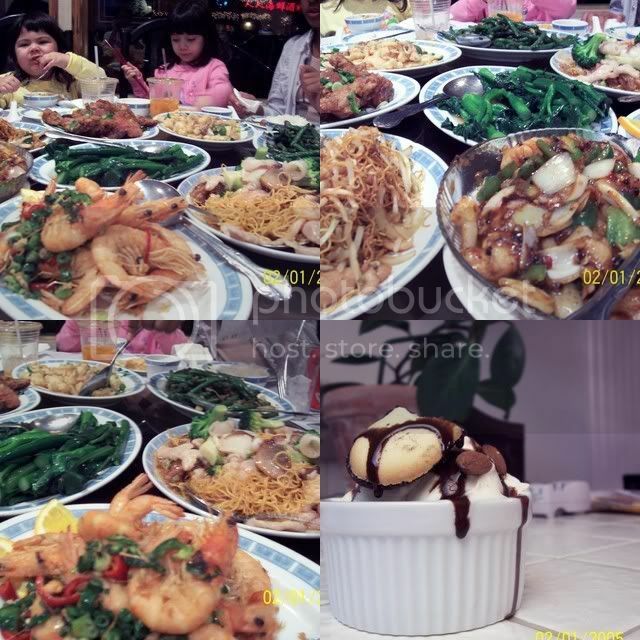 Sister O and Sister S treated us to another sumptuous meal in Los Angeles’ Chinatown too! Huwawww!!! Grabe as in my jaw dropped. Sarap and I miss the motherland especially that bowl of ar-arusep. Welcome back ate! Wow all those delicious food made me hungry and I just at breakfast! Hi Jules! omg, you and I think alike! that’s been my fantasy too, to eat all I want and never get fat. LOL! OMG!! The food! The food! The food! I must have spent like 10 minutes smacking my lips in front of the monitor. You Be One Lucky Guest! My idea of heaven is a tropical paradise with a buffet… where you never get full and you never get fat! It appears your vacation to the Philippines would fit into my idea of heaven. DELICIOUS!!! give me that hito! and correct me if i’m wrong, that’s himbabao right? kainggit ka! what a spread! just the ones we really miss and enjoy more than anything! btw, my dad hails from aringgay too! 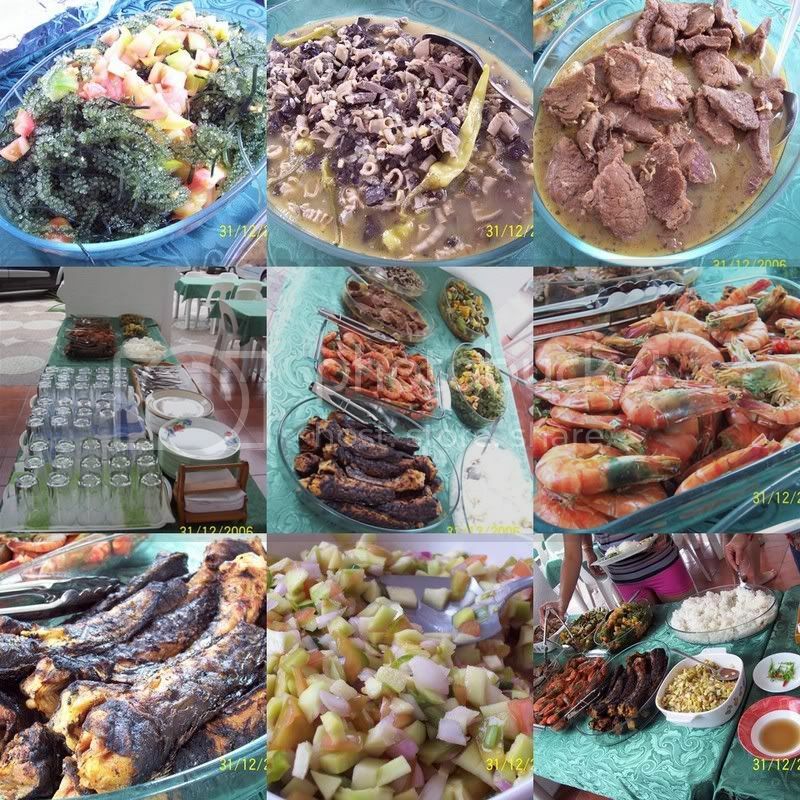 hi mae, those are my favorites too, well, just about everything seafood was my favorite 🙂 Yes, that long purple thing was ube cake. There was also puto bumbong and buko pie with it, they didn’t show well in the shot though. hi toni! I think eating is the Filipino disease. lol!! We really do love to eat, and the funny thing is my Aunt even brings snacks in the car when we went out sightseeing. We’d tell her at the onset, “no need auntie, we just ate!” but we are always grateful when she starts passing out snacks while we’re driving around. hehe! Foooood! Lots of food! Grabe, ang sarap naman. What a feast! 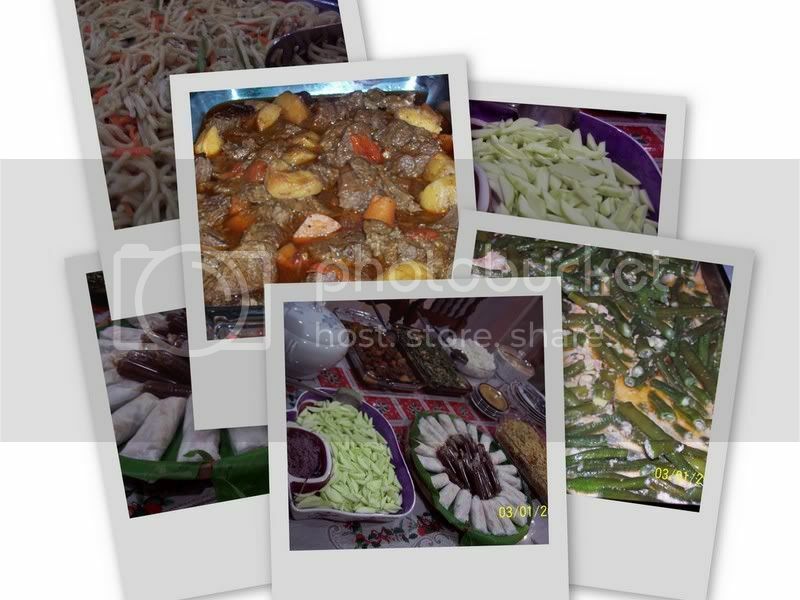 Your family really does love to cook and eat… or is it are being Pinoy? Hehehe. The spread looks wonderful. Nagutom ako ha.